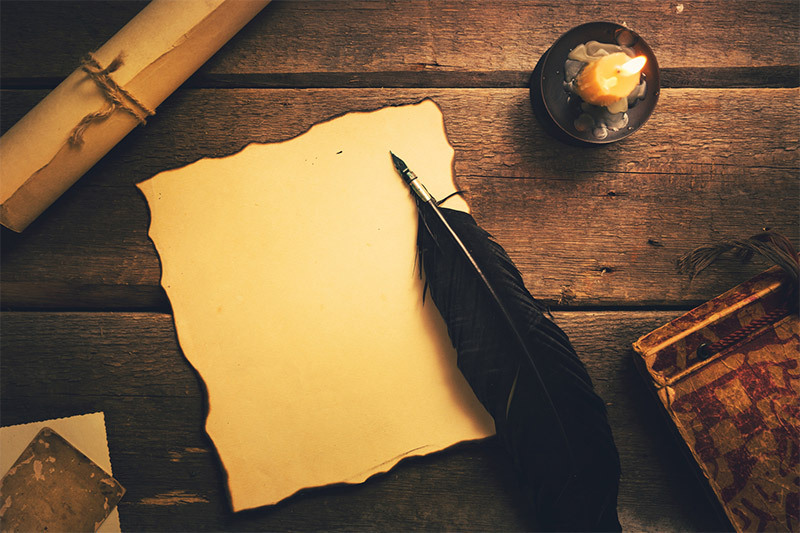 How tables, tablecloths and table manners were revolutionary. It would be wrong to assume that tables, table cloths and table manners have always been with us. While spoons were used in Egypt 15,000 years ago, objects such as dining tables only came into common use during the times of the Ancient Greeks and the Roman Empire. Early Egyptian spoons were fashioned from seashells. Around 3000BC, in the region now known as Switzerland, people apparently used wooden spoons at the same time that metal spoons appeared in the Middle-East. In 2000BC, spoons were made from horn in the Asia Minor region. The term 'spoon' comes from the Swiss word spon meaning 'chip' or 'splinter'. 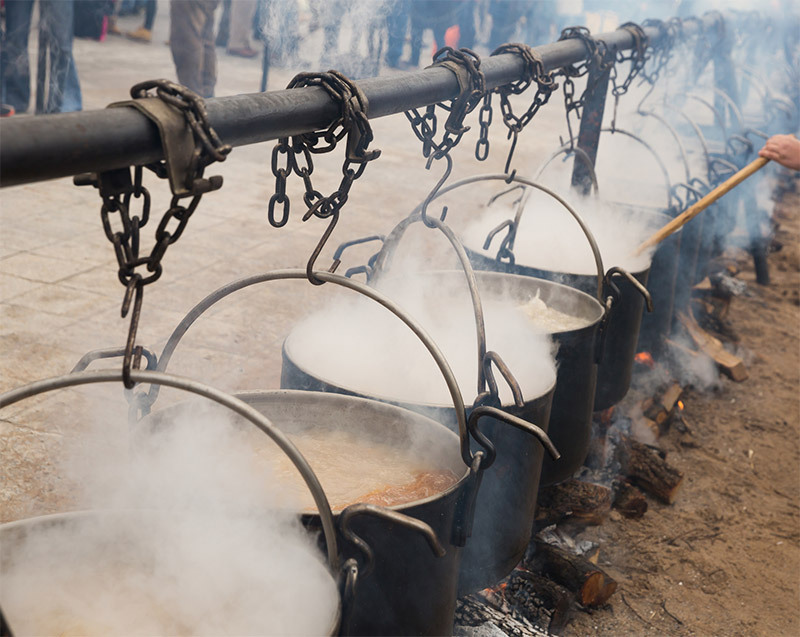 Tablecloths and trestle tables were in use during Medieval times but eating with bare hands and drinking soup straight from the bowl were common practice. Meat served on platters would be speared with a knife, ripped into pieces and placed on a board or thick slice of stale bread to be shared by two people. Knives, spoons and cups were also shared. A knife might also be used as a weapon so common etiquette required it to be used as little as possible and always with the blade pointed away from others. There were no napkins in these times, so diners wiped their hands on the tablecloth. It may be obvious to us now that a table is an item of furniture with a flat top and one or more legs. However, there was a time in history when we did not sit at dining or kitchen tables adorned with tablecloths to eat meals, using utensils and napkins. The Ancient Egyptians used stone platforms to keep objects off the floor but people did not sit at them. Meals were served on large plates placed on pedestals where people would stand to eat and drink, perhaps like we do today in the "front bar” of some Australian country pubs. The Egyptians also made use of various small tables and elevated playing boards. Very early tables were used by the Chinese to practice the arts of writing and painting but not for dining. The Ancient Greeks and Romans made more frequent use of tables for eating. Their tables were carved from stone, wood or made from metals such as brass or silver alloys. They were far too beautiful and ornamental to be covered by a cloth. The table manners of the times required the diner to wash their hands in a bowl before eating and to use a napkin throughout the meal. Later, larger rectangular tables were made of separate platforms and pillars. The Romans also introduced a semicircular table to Italy, the mensa lunata or moon table. Following the collapse of the Roman Empire, there was a collapse in European table manners back to prehistoric times. Lacking the discipline of the Roman Empire, it was far more dangerous on a daily basis in Western Europe with constant invasions and wars. As a result, functional trestle tables that could be easily set up and dismantled came into use. Hence the phrase, "set the table”, which is still in use today as are trestle tables in schools and community halls throughout Australia. Following the Medieval period, when Europe stabilised during The Renaissance in the 16th century, the 'refectory table' was an advance on the trestle table. It was long and wide, seating many people and supporting a sizeable banquet in the great halls and castles. The 19th Century period of the Industrial Revolution brought with it mass-manufacturing of tables and chairs from a variety of materials including timber, metals and later on plastics for both indoor and outdoor use. Tables became available in a variety of sizes and shapes including square, rectangular, round, oval and semi-circular. Quality individually hand-crafted timber tables and furniture are much harder to find these days but can be sourced from smaller local craftspeople such as 'Tongue N Groove Furniture' on the Gold Coast, Australia. The term 'table' comes from the Old English word tabale which has its roots in the Latin, tabula. Literally, it means "a board, a plank, flat top piece”. The current spelling of 'table' reflects the influence of the French and our affair with French culture. A tablecloth covers a table to help protect it from scratches and stains. A tablecloth, which can also be an ornamental covering, is spread out over a table top before laying out the tableware and crockery. It is generally accepted that tablecloths should drape over the table by about 8-16 inches (20-40cm) to ensure it is above or just on the laps of seated diners. Today, tablecloths can be a functional covering made from polyester or plastic or a printed fabric made from fine textiles such as linen and cotton. When a tablecloth is designed as part of an overall table setting, it is often accompanied by coordinated napkins, placemats, drink coasters and other decorative pieces. The shapes and sizes of table cloths throughout history reflect the shape and size of the tables used in the various eras. The first tablecloths may have appeared in Europe around 100AD as mentioned by the Latin Poet, Marcus Valerius Martialis. The Roman Emperor Charlemagne apparently used an asbestos tablecloth. He would throw it into the fire after dinner but it did not burn. Charlemagne used this trick to convince barbarian guests of his power and supremacy. Tablecloth tricks are still performed today by pulling a loaded tablecloth away from the table while leaving the plates behind. This trick relies on the laws of 'inertia'. During the Medieval period, spreading a high quality white linen or cotton cloth was an important part of preparing a feast in a wealthy household. These tablecloths were hand-woven by Master Craftsman. In Umbria, central Italy, Perugia's white tablecloths have been woven with the blue stripes and patterns associated with Church linen since Medieval times. The homes of the wealthy in Victorian England were full of thick fringed drapes in deep colours, including tablecloths that reached to the floor. Prior to the beginning of the Industrial Revolution in the late 18th Century, tablecloths were hand-made. During the revolution the textile industry mass manufactured products in new fabrics for clothing, drapes, tablecloths and napkins. 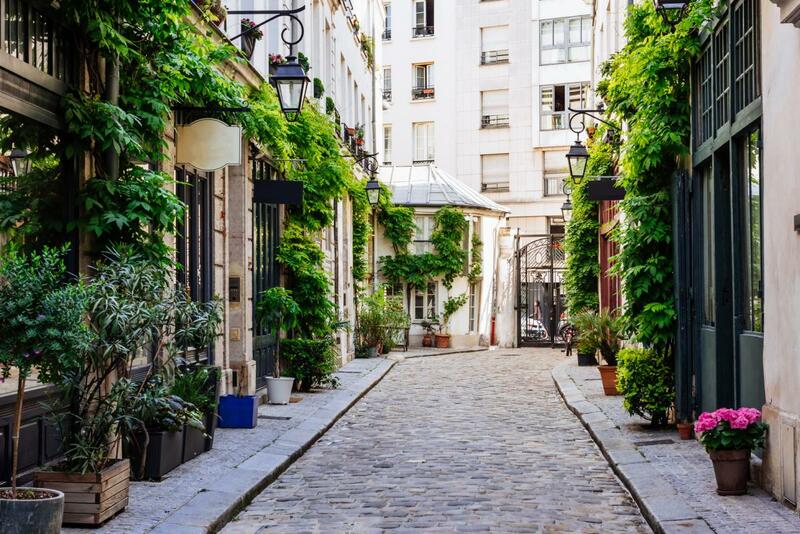 Parisian cafés have been around since the 17th century and function as a center of social and culinary life in Paris in addition to the traditional family meals served in the home. By the 1880's, coinciding with the Industrial Revolution in France, there were around 45,000 cafes in Paris, thus the demand for tablecloths and napkins was high. As a result of the Industrial Revolution, the largest influence on the manufacturing of table coverings and other textiles was the sewing machine which replaced hand-sewing and weaving. In addition to the inventions of the Braille reading and writing system for the blind, pasteurization of food and the metric measuring system, the sewing machine was invented by a Frenchman during the Industrial Revolution. Barthelemy Thimonnier was a tailor by trade and worked tirelessly his whole life, at perfecting his "Couseuse", the sewing machine. In 1830, he opened up a sewing factory on the Rue de Sevres in Paris, but the next year it was destroyed by about 200 irate tailors, who trashed 80 machines, claiming that this invention threatened to put them all out of business. Although other inventors had been working on the idea, it was Thimonnier's chain-stitching machine that provided the first practical application of the sewing machine. Even though Thimonnier won prizes and his sewing machine was highly esteemed, it was the American, Isaac Merrit Singer, who turned the sewing machine into big business, with his ingenious marketing strategies, guaranteed service of machines and instalment payment plans. Meanwhile, Thimonnier died a poor man when he was 64 years old. The Exposition Universelle of 1900 was a world's fair held in Paris to celebrate the achievements of the past century and to accelerate development into the next.” It was an opportunity for the World to have an affair with France. Interior Design was a feature of the exposition with the new style of Art Nouveau and Art Deco being displayed. The Victorian fabrics with their plain solid looks and dark colours were replaced by light and pastel colours inspired by nature in a fashion-oriented move. "...The sight of brightly coloured tablecloths with their distinctive patterns of olive branches, vines, sunflowers, lavender, lemons and cicadas is enough to trigger longings for the south of France. 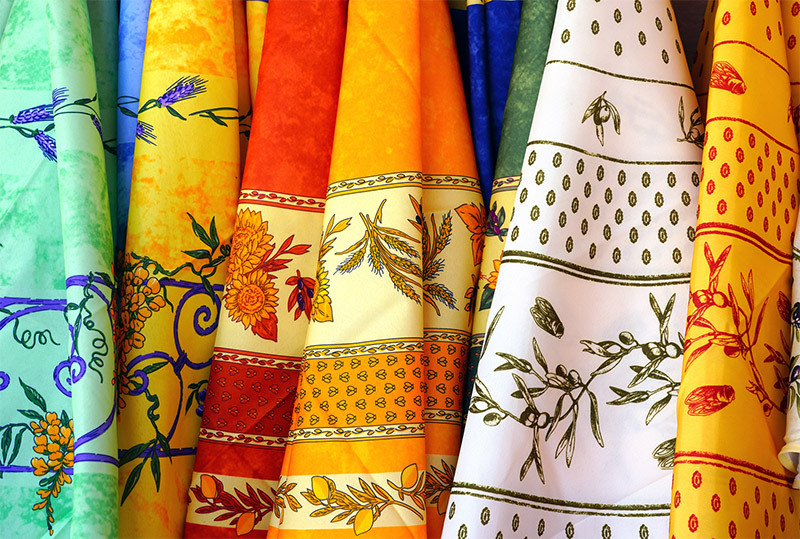 The intense sun-drenched colours of these vibrant, bright fabrics are an iconic symbol of Provence, France. However, they were not originally created in France. These exotic textiles first arrived in France from India in the early 17th century mainly through the port of Marseille. Les indiennes, as they were known, were an instant success in Europe for clothing and furnishing. These luxurious fabrics were light, bright and importantly, colour fast and the French loved them. Responding to demand, the French soon started producing their own version. Les indiennes became all the rage at the French court. The new style was satirised by Molière in a production of his comedy Le Bourgeois Gentilhomme (1670), in which the playwright himself played the vulgar nouveau riche merchant M. Jourdain in a dressing gown made of the fabric - with the pattern printed upside-down. Dangerous Liaisons is an American historical-drama film set in France in the 1700s and based on Christopher Hampton's play Les liaisons dangereuses, adapted from the 18th-century French novel by Pierre Choderlos de Laclos. The film gives a hint of the beginnings of the influences of les indiennes fabrics on the fashion colours and interior designs of the time. Although artisanal production was hit hard in the aftermath of Europe's industrialisation, and many small companies closed down, today's les indiennes fabrics and tablecloths are more popular than ever in Provence and many of the companies in the region have long and proud histories. If you're shopping for authentic French table linen and the prices seem really cheap, it's probably because they are made in Asia and the fabric is a low quality copy.